Middleton Place Gardens in Charleston, SC. Photo courtesy of Middleton Place website. The beauty of Charleston, SC will hold you captive all by itself. From the mesmerizing views at Middleton Place Gardens to the Pineapple Fountain at Charleston’s Waterfront Park, your eyes will have a plenty to behold. Have you not been here? What are you waiting for? Not only will you be enamored with this city’s storied history, you will be more than impressed with the cuisines that are prepared here. The Unknown Cook has been impressed with the Noisy Oyster restaurant since we moved to the Charleston region a few years ago. There are two locations for the convenience of tourists and natives in the area. On our visit last night, the unknown cooks that prepared our dishes at the Noisy Oyster in North Charleston completely won over our taste buds. Yes, the atmosphere of the restaurant is amazing. Our service from Steve was impeccable. The hostesses were delightful when we arrived and when we left. And the manager visiting our table to ensure everything was going well was a great compliment to our overall experience. But the heroes of this visit are the unknown cooks that skillfully prepared our dishes. Not just for me and my family mind you. The place was full of patrons and the food was coming out in a timely fashion all around us. Whoever these cooks are, they were on their “A” game last night. Golden Fried Calamari at The Noisy Oyster. Taken with my S2 and edited in Picasa. You must try this dish! orders and was back to serve them in no time. We placed our orders for a couple of appetizers while we continued to decide what we wanted for our entrees. Now, if you want to talk about adjusting to the personalities of guests, this guy was a pro. Have you ever been to a restaurant establishment and found yourself adjusting to the personality of your server? I have. If my server comes to the table with a crummy attitude, then so goes my crummy attitude. But that’s another story. I watched Steve as he took care of his guests around us. He was very good at this serving thing. 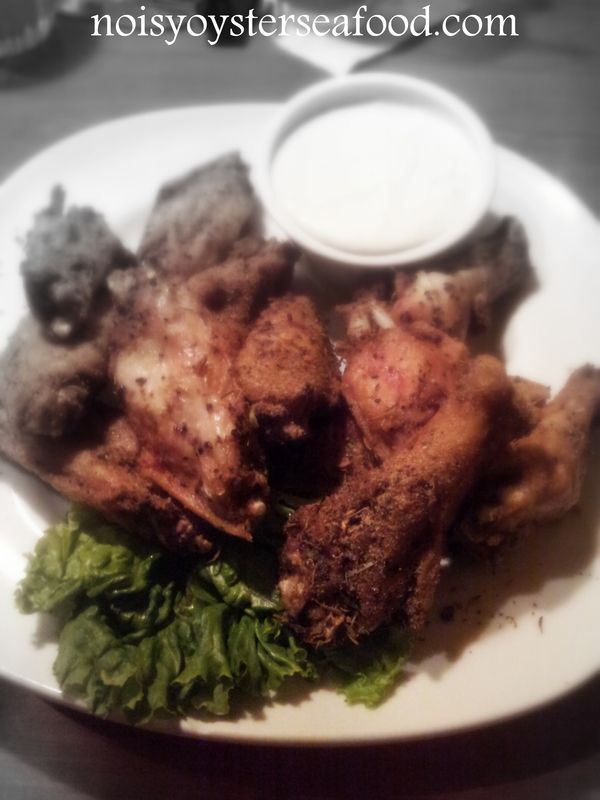 Jamaican Jerk wings at The Noisy Oyster. Taken with my Samsung Galaxy S2 and edited in Picasa. Enough about Steve’s remarkable service. Let’s talk about what he delivered to the table to us for our appetizers. First off his serving tray was this nicely plated Jamaican Jerk wing dish. I could already smell how nice these were going to taste. They were seasoned perfectly and the ranch dressing complimented the taste of the seasoning really well. Next came one of my favorite appetizers in any place I visit that has it – Fried Calamari. 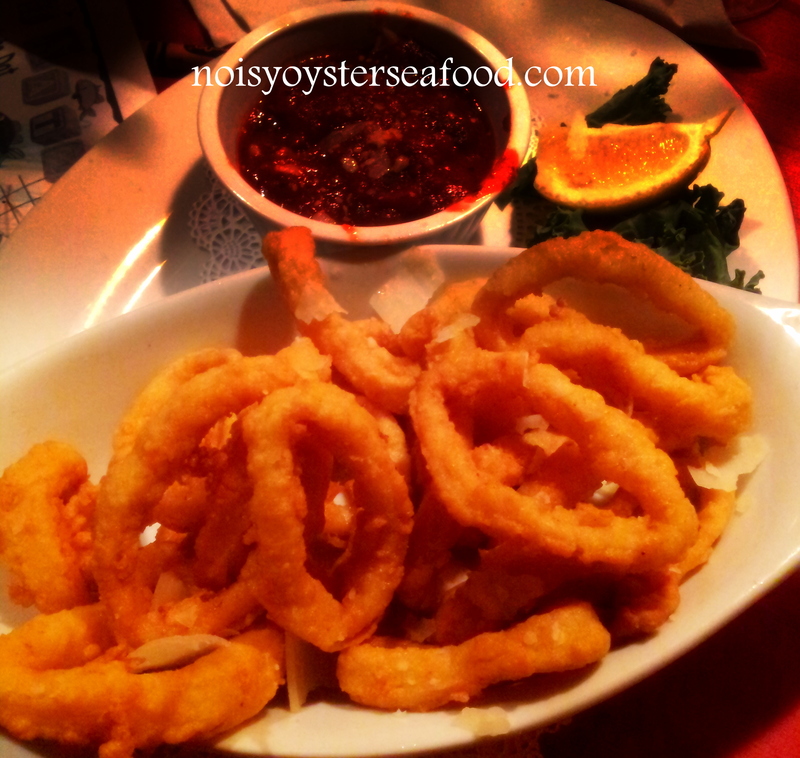 This Calamari was breaded and fried to a crisp golden texture. The taste was so amazing that our 2-year old took a liking to them. Now a days, Goldfish is his food of choice. Finally off the tray came the Crab Stuffed Green Tomato Tower. I don’t know which one of those outstanding unknown cooks prepared this, but I am pretty sure they deserve an award for that awesome flavor and assembling the tower where it didn’t fall over. How did they do that? Indeed, the Noisy Oyster’s unknown cooks won over our taste buds and if you haven’t experienced this place yet, prepare for your taste buds to fall in love too! While we only told you about the appetizers, our entrees were even more impressive. As a former restaurant professional, I know when I taste the skills of some awesome cooks. The guys and girls at the Noisy Oyster don’t mind letting you know. We don’t always get to see who is preparing our food in any restaurant establishment or even get to say thank you to them. The Unknown Cook wants to let the unknown cooks at The Noisy Oyster know that you are appreciated. But, I’m sure you guys already know that! Until our next visit, keep the noise going! Posted on September 6, 2014, in Uncategorized and tagged best appetizers, best calamari recipes, best seafood restaurants, best seafood restaurants in Charleston, Charleston, charleston seafood, fresh oysters, Noisy Oyster, noisy oyster in Charleston, noisy oyster menu, oysters, SC, sc seafood, seafood, seafood in charleston sc, seafood restaurants, seafood restaurants in Charleston. Bookmark the permalink. 1 Comment.